The number of Palestinians killed by Israeli security forces during protests in the Gaza Strip has climbed to 10 while over 1,000 others were wounded by bullets, Palestinian officials said on Saturday.The incident occurred on Friday when the Israeli Army opened fire on protesters near the border with Israel, Efe news reported. Gaza Health Ministry spokesperson Ashraf Al Qedra confirmed that 10 people had died during the clashes. He added that 1,354 people were wounded, including 491 by ammunition and explosives. The so-called "March of Return" campaign convened by Palestinian factions in Gaza started on March 30 with demonstrations, marches and sit-ins near the border with Israel. Since then, 32 Palestinians have died in the Gaza Strip. The six-week protest campaign to mark Land Day, is an annual commemoration of a 1976 protest against Israeli confiscation of Arab-owned land. 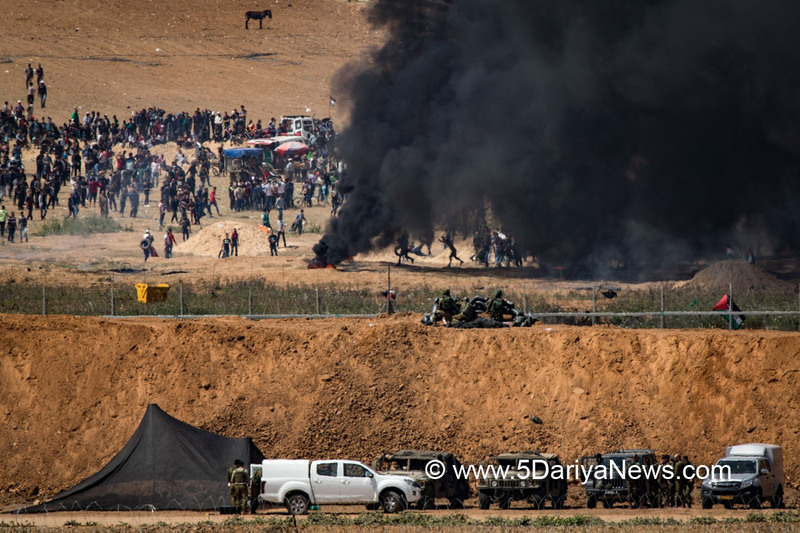 Israel deployed snipers along the border fence and warned it would not allow anyone to cross or approach, or put the security of its citizens in danger.On Friday, about 20,000 Palestinians participated in protests dubbed the "Friday of Tires" at the border, according to the Israeli Army. It accused the protesters of "terrorist acts" such as launching explosives and incendiary objects and damaging a security fence.Meanwhile, the UN human rights office deplored the reported use of "excessive force" by Israeli soldiers during the March 30 protests in Gaza, where at least 16 people were killed and more than 1,000 others injured.Friday's protest, however, was smaller in scale than that of last week, which was estimated to bring together about 30,000 Palestinians.